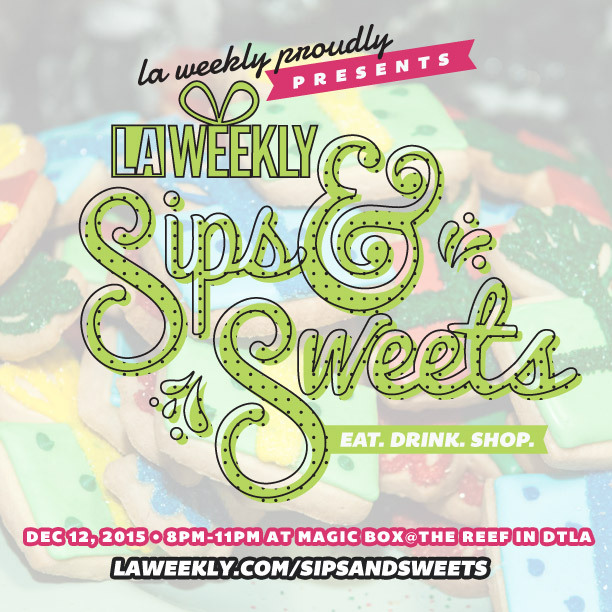 The final line-up has been announced for LA Weekly’s Sips and Sweets event, taking place December 12th. Get hopped up on sugar, cooled down by beverages and shop holiday gifts all under one roof at the fabulous space that is Magic Box in Downtown Los Angeles. This 21+ event will be going down from 8pm – 11pm with a VIP Hour from 7pm – 8pm, and will feature some of my favorites, such as Hinoki and the Bird, Butchers & Barbers Faith & Flower and many more. Mikki Kristola of The Varnish, Robin Chopra of Corazon y Miel, Chris Whelan of Sassafras Saloon, Ryan Wainwright of Terrine, Darwin Manahan of Osso and Cliff’s Edge, Ben Scott of Alexander’s, Avery Underhill of Butchers & Barbers, Christiaan Rollich of The Lucques Group, Michael Lay of Broken Spanish and B.S. Taqueria, Addam Reagan of Sonny’s Hideaway, Gabriella Mlynarczyk of Birch and The Loving Cup, Jesus Gomez of 1886 Bar, Edwin Osegueda of Faith & Flower, Adam Nystrom of EP + LP, Eric Shani of The Pikey, Matt Wise of The Roger Room, Cappy Sorentino of Hatchet Hall, Feisser Stone of Hinoki & the Bird, and Ivan Pacheco of Ledlow. Cake Monkey Bakery, Megan Potthoff of WP24, Courtney Reed of Belcampo Meat Co., Monica May of Nickel Diner, Beth Kellerhals of Ledlow, McConnell’s Fine Ice Creams, Coco Kislinger of Coco Bakes LA, Tyler Malek of Salt & Straw, Sasha Crescentini and Dawn Martel of Bakeology, Frederic and Fabienne Soulies of Pitchoun! Bakery, Nancy Hytone-Leb, Michael Leb & Bob Michero of Choctal, Carlos Enriquez of Superba Food + Bread, and Jim Osorno of Broadway Baker. The Awesome peeps over at LA Weekly have graced me with two general admission tickets to giveaway to one lucky reader! ENTER HERE for your chance to win. Contest ends December 2nd at 12am. Tickets can be purchased here, with general admission and VIP options available. Advance pricing ends November 29th, so be sure to snag your pair before they do. LA Weekly has invited me as media to attend Sips and Sweets. All opinions, like always, are my own.